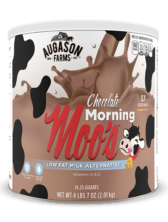 Augason Farms® Chocolate Morning Moo’s Low Fat Milk Alternative makes a delicious milk chocolate beverage with all the advantages of regular Morning Moo’s. A whey-based beverage formulated to look and taste like chocolate milk, most people describe it as richer and thicker. 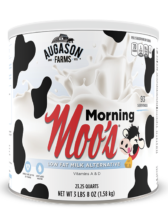 Augason Farms® Country Fresh 100% Instant Nonfat Milk is a first-rate substitute for the real thing, and a useful part of any food storage program. 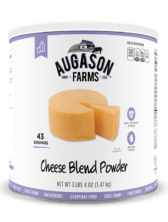 It’s an economical alternative to whole milk, high in calcium and fortified with vitamins A and D. Great cooks know that Instant Nonfat Dry Milk helps enhance their baked items, giving them that wonderful golden brown look. It also improves the strength and structure of baked goods, retaining moisture and keeping them fresh longer. It’s useful in recipes that call for milk because it’s made from whole cow’s milk. Just add the indicated amount of water. Use it in your daily cooking and outdoor camping, as well as storing it for emergencies. 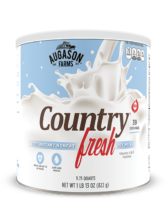 Augason Farms® Country Fresh 100% Instant Nonfat Milk is a first-rate substitute for the real thing, and a useful part of any food storage program. 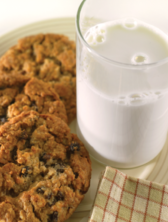 It’s an economical alternative to whole milk, fortified with vitamins A and D. Great cooks know that Instant Nonfat Dry Milk helps enhance their baked items, giving them that wonderful golden brown look. It also improves the strength and structure of baked goods, retaining moisture and keeping them fresh longer. 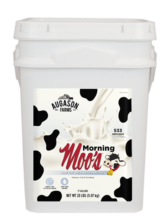 It’s useful in recipes that call for milk because it’s made from whole cow’s milk. Just add the indicated amount of water. 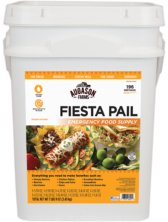 Use it in your daily cooking and outdoor camping, as well as storing it for emergencies.